The robot is a semi-automatic, with a push-button control panel. A person determines arbitrary patterns (figures) of the market and directly on the chart restricts them to lines. Inside the specified pattern, the robot automatically trades, concluding and accompanying transactions. After the price leaves the pattern, trading stops until a new command of the person. The trader finds on the chart any of the well-known patterns (oblique, tapering or widening trend channel, horizontal flat, triangle, flag, pendant, etc.) and designates it by limiting lines manually. This eliminates errors and inaccuracies inherent in purely machine algorithms. A robot trades from one border of a given pattern to another border multiple times, until the price goes beyond the limits of the pattern. After that, the trade stops and the robot waits for new instructions from the trader. Reset - reset to the initial state (the initial state is set by the input parameters). Lot - lot of orders. Step change goals (pips) - step to change placed order targets (points). This robot can be used on 5 and 4-bit accounts. The initial deposit is from $10. 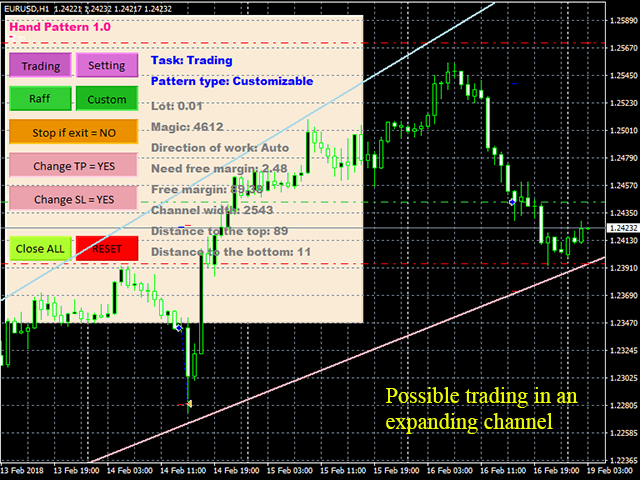 Currency pair and timeframe can be set any. You can simultaneously include multiple copies of the robot in one trading terminal (with different Magic). If the market pattern is correctly set, several profitable trades should be obtained in one work cycle and one loss-making transaction is possible (shown in the screenshots). 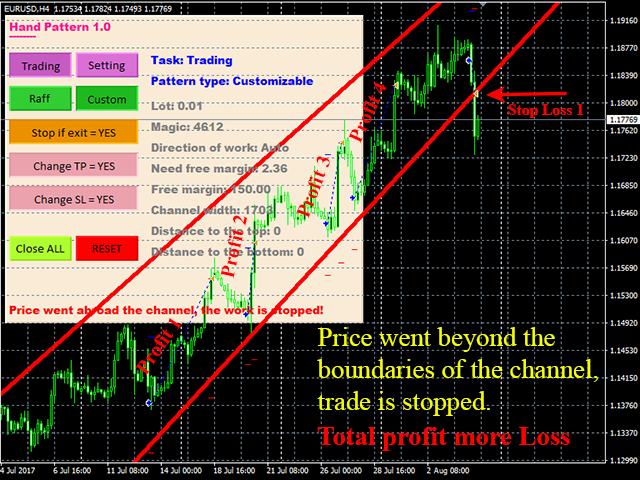 Loss-making transaction is obtained in the case of going beyond the border of the pattern against the trend. But the amount of profit should be greater than the resulting loss. Features of robot testing are shown on video. It is not advisable to simply start the robot and wait for a profit. Such trade will not be optimal. 1. Manually set the boundaries of the pattern. To do this, press the Setting button. 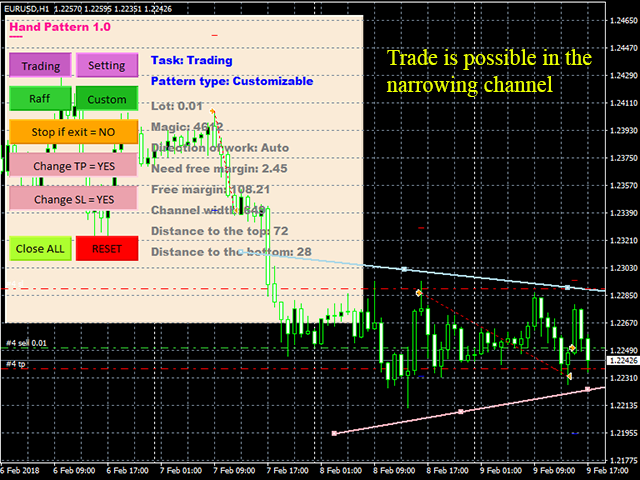 The robot will draw two lines, by which the trader must manually designate the boundaries of the pattern on the chart. By default, the Raff channel build mode is turned on, it should be disabled with the Custom button and manually on the graph move the bounding lines so that they cover the desired pattern that is currently present on the market. The robot will remember the position of the lines. 2. Start of trade. To do this, press the button Trading. The robot will work by setting and escorting orders when the entry criteria is met. 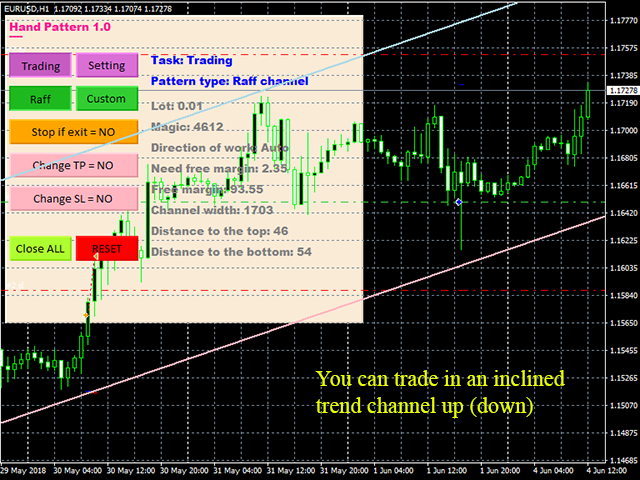 The robot trades while the price moves within the specified pattern on a trend. When the price leaves the zone of the pattern, the robot stops working. In this case, the limiting lines become red. To restart the robot, you must specify a new pattern. To do this, press the Setting button, and again manually designate the new pattern with lines. Then re-run the trade by clicking the Trading button.